The flanged brim is a wonderful hat shaper with brim. The brim measures 3 1/2 inches in the back and widens as it comes around to a 4 1/2 brim in the front. While this is an exclusive design of mine, it has the potential of being the base crown/brim for hundreds of styles from past centuries. A little vision and you will be able to recreate bonnets as seen across the ages. Made into a lightweight white wool it can be worn in early spring as you work out in your gardens. 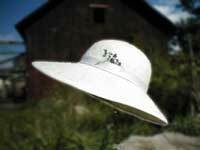 It is possible to create the hat so that the longer brim in over the back of your neck to protect you from the sun. This is my favorite of hats, so feminine and soft looking, changing into a bawdy and loud hat when embellished with color and feathers.